I love Love LOVE this dish. I could eat these kind of things every night for dinner. My good friend, Tansy, brought me this dish after I had my baby. We dug in and it was so tasty. I can't believe it's taken me this long to make it again. Jason and I even had a few hour argument of what kind of tortillas Tansy put in the casserole. I was right, of course, but he still thinks he is right. Ha!! She put corn in, which I think gives it a better flavor. He insists she put in flour, but she said if you use flour the tortillas gets all gooey...and who wants that?! Give this a try. It's awesome...seriously...awesome! 1 packet of taco seasoning, or you can use the good homemade kind. Preheat oven to 350 degrees. Brown beef in a large skillet. When it's done throw in the black beans, undrained, and taco seasoning. Cook until the liquid is just about gone. In a large bowl mix together sour cream, chilies, salsa, and cream of chicken soup. Cut your tortillas into quarters. 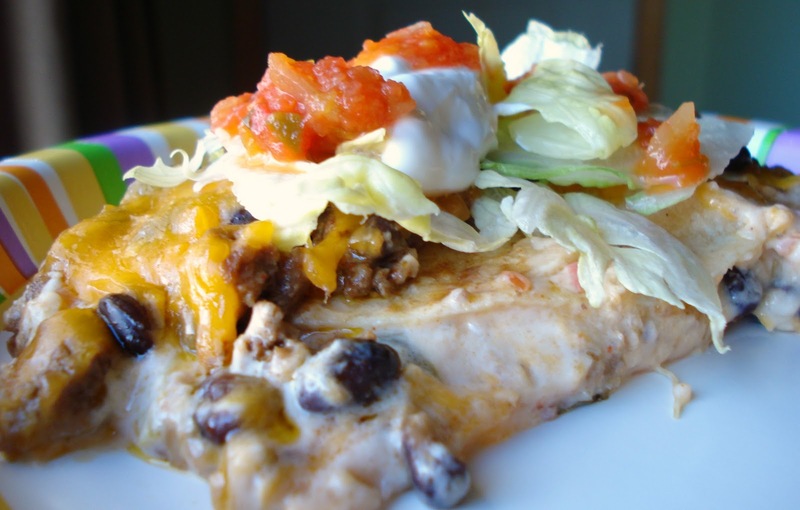 Layer your ingredients, starting with the sour cream stuff, in a 13x9 casserole dish. Then tortillas, meat, cheese. Repeat layers and top with lots of shredded cheddar cheese. Cover with foil and bake for 30-40 minutes. We topped ours with lettuce, tomatoes, olives, green onions, avacados, salsa and ranch. Mmmmm...it was sure tasty! Wish there were some leftovers for lunch. I love how easy this is and the ingredients are things I always have on hand. Will be trying this for sure! Do you have to add water as directed on the taco seasoning packet? Hi, Megan! No. Just throw it in with the un-drained black beans. The juice from those will help incorporate it all. Happy cooking!